Between the hours of 6.30pm and 8.00am on weekdays, weekends and bank holidays, emergency calls are handled by NHS 111. If your medical problem is not urgent, please telephone our Practice during normal opening times or call NHS 111 for general health advice. However, if you need medical help outside of our surgery hours, you can either telephone our Practice on the usual number 01202 723372 where you will be directed to contact NHS 111 or ring NHS 111 on 111 directly who will direct you to the service that is most suitable for your needs. NHS 111 is a new service to make it easier for you to access local NHS healthcare services. 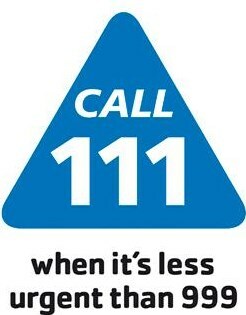 You can call 111 when you need medical help fast but this is not for a 999 emergency. If a health professional has given you a specific phone number to call when you are concerned about your condition, continue to use that number. For immediate, life-threatening emergencies, continue to call 999.